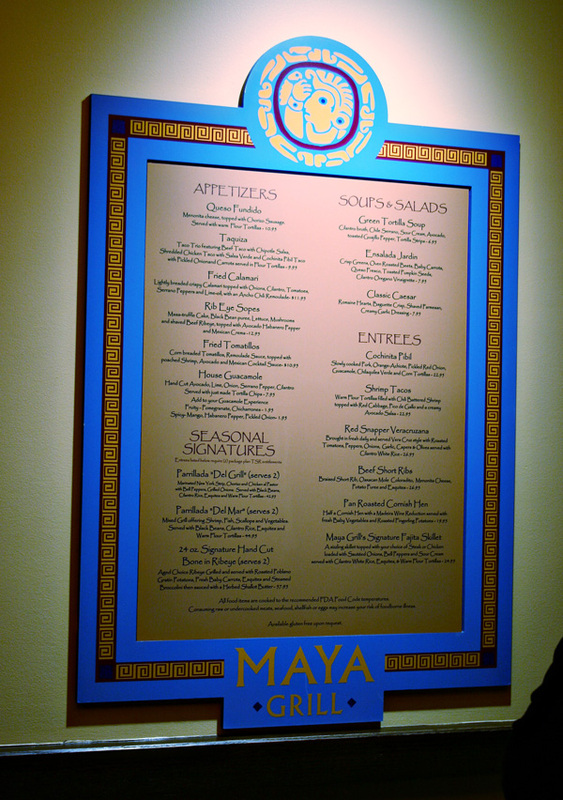 Located inside the Coronado Springs Resort at Walt Disney World, the Maya Grill offers a creative mix of flavors. The Mayan-inspired architecture sets the scene for an upscale dining experience that still feels relaxed and comfortable. Open only for dinner, the menu offers Tex-Mex dishes from traditional platters to Chef’s specialties. 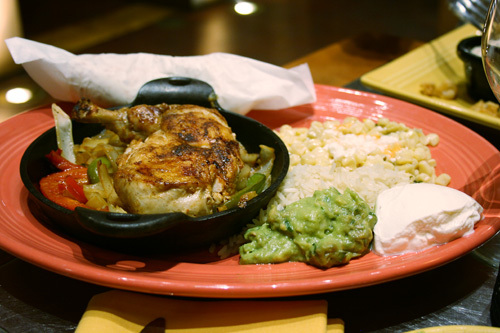 On the menu are a classic Caesar salad, pan-roasted Cornish hen, red snapper, coconut flan and of course, margaritas. As a SoCal native, I’ve had my share of authentic Mexican food. 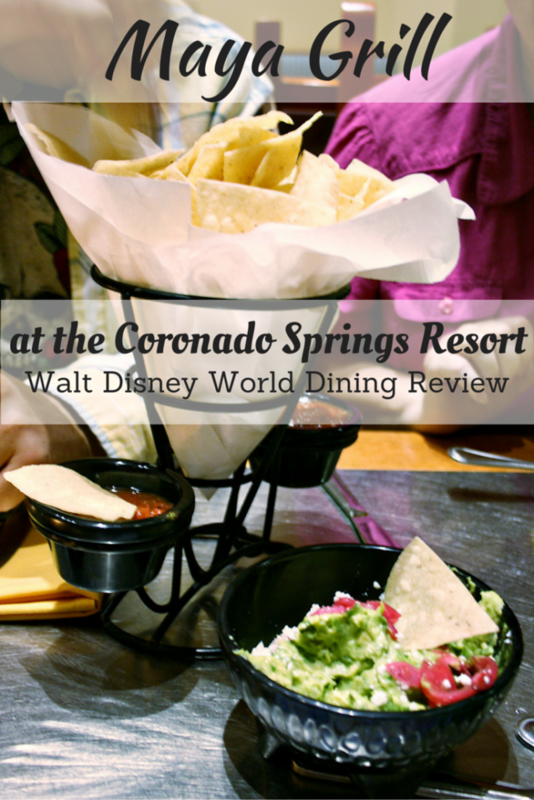 However Tex-Mex is new to me, so my family and I were looking forward to trying out the cuisine at the Maya Grill on a recent Disney trip when we stayed at the Coronado Springs Resort. I wanted to see how the dining experience compared to what I’ve eaten south of the border. I was accompanied for dinner by my mom, brother and three-year old son. Though it’s highly recommended to have Advance Dining Reservations (ADR) at most Walt Disney World restaurants, my brother was able to make reservations at the restaurant about 45 minutes ahead of time while we were checking in to the hotel. 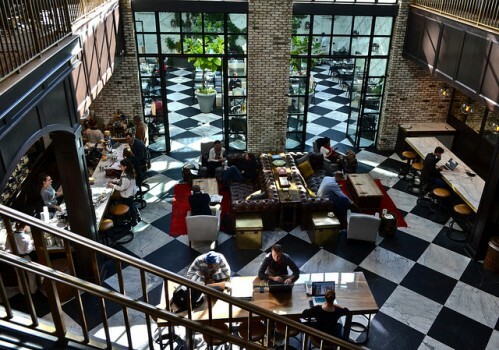 The restaurant design itself is impressive, with beautiful Mayan-inspired murals on the walls and vaulted ceilings. There are torches throughout the romantically lit space to add to the ambiance. The restaurant overlooks Lago Dorado, but it was too dark to see outside at the late hour we had dinner. 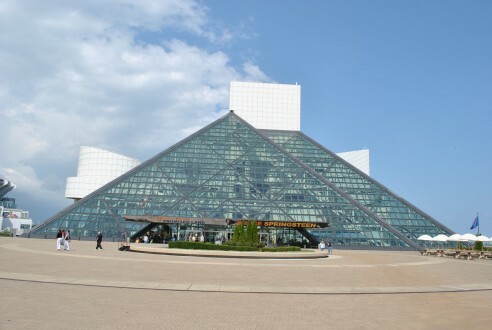 There was a guitarist playing near the entrance with his music amplified throughout the dining space. Perhaps it was just our area but the music was so loud we were having trouble hearing the conversation across the table. The musical choice was also a bit “nontraditional” and with an 80’s slant, which didn’t really fit the mood of the restaurant to us. To start, we ordered the House Guacamole ($7.95), which came with salsa and tortilla chips. We love guacamole and this version was delicious! It was a chunky blend of hand cut avocado, lime, onion, serrano pepper and cilantro and topped with cotija cheese and pickled red onions. The pickled onions offered a sweet and vinegary flavor that we really loved. It was a very unique flavor and none of us had ever had pickled onions before. The bowl of guacamole was large and a good value (we probably could have ordered several of these and been content for the night!) The salsa was a bit on the sweet side for us but mild enough for my three-year old to eat with his chips. We didn’t feel that the chips tasted very “fresh made” as the menu suggested but given the late hour, they had probably been prepared hours earlier. My brother chose the Fried Calamari ($12.95) from the appetizer menu as his main course. 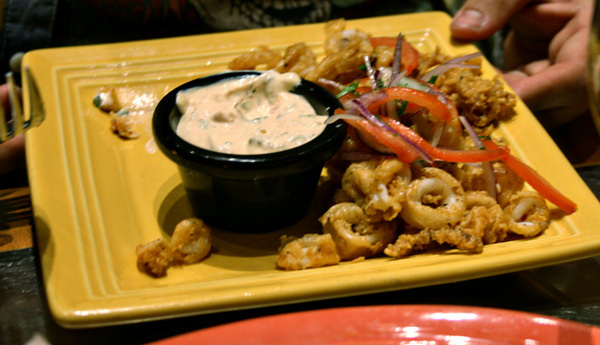 He enjoyed the lightly breaded calamari, which he said had a nice flavor and wasn’t greasy. We had a hard time deciding what to order between the shrimp tacos, fajita skillet and Conchinita Pibil (slow cooked pork). 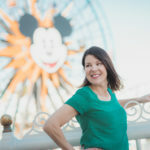 There are also some Seasonal Signature Tex-Mex offerings with platters sized for two (these dishes require two package plan Table Service Restaurant entitlements on the Disney Dining Plan). Coming from Southern California, we are accustomed to large, overflowing platters of Mexican food in our local restaurants. This skillet had a good amount of food but we each probably could have eaten it on our own. We opted for the chicken which also included sautéed onions and bell peppers. There was about a half cup each of cilantro white rice and esquites (corn), along with a dollop each of guacamole and sour cream. 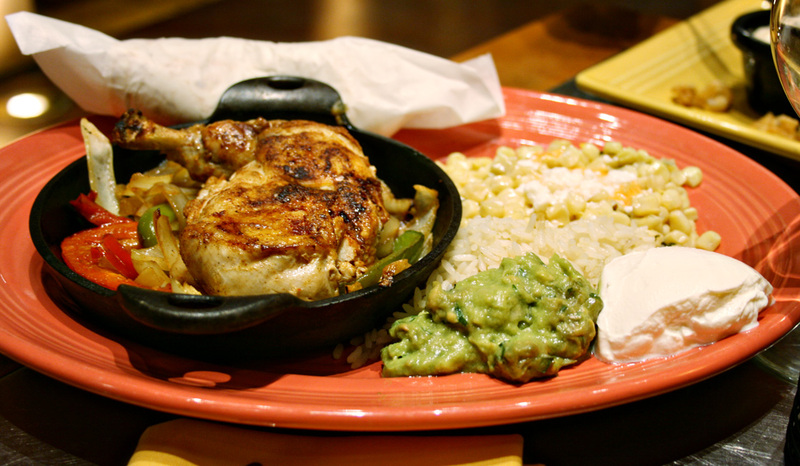 The dish lacked the heat and spice we are used to from authentic Mexican food but was still satisfactory. We shared the warm street taco sized tortillas between us. I had opted not to order my three-year old son his own dish, only requesting an extra plate. On second thought I should have ordered him the kid’s quesadilla or the Catch of the Day because the fajita skillet we shared was much smaller than expected. We considered ordering dessert but at this point it was nearly 10 p.m but we’d been traveling all day and were getting tired. Also our waitress took quite a while clearing the dishes so we were ready for the check at that point. I did see the “dessert shots” being served and I’m sure they were just as delicious as they were pretty. Guests have their choice of key lime, cappuccino dulce de leche, chocolate mud pie, peanut butter parfait and Gran Marnier berries n’ cream. At $3.00 each, I would suggest ordering several dessert shots to share at your table. In all, the Tex-Mex dinner at Maya Grill in the Coronado Springs Resort was tasty though I felt that it was overpriced based on the small servings. The guacamole was the highlight of the meal (and was enjoyed again the following night at the Rix Lounge). I’d recommend going straight for the appetizers, skip the main course, leave room for a few of the dessert shots and perhaps indulge in a margarita!